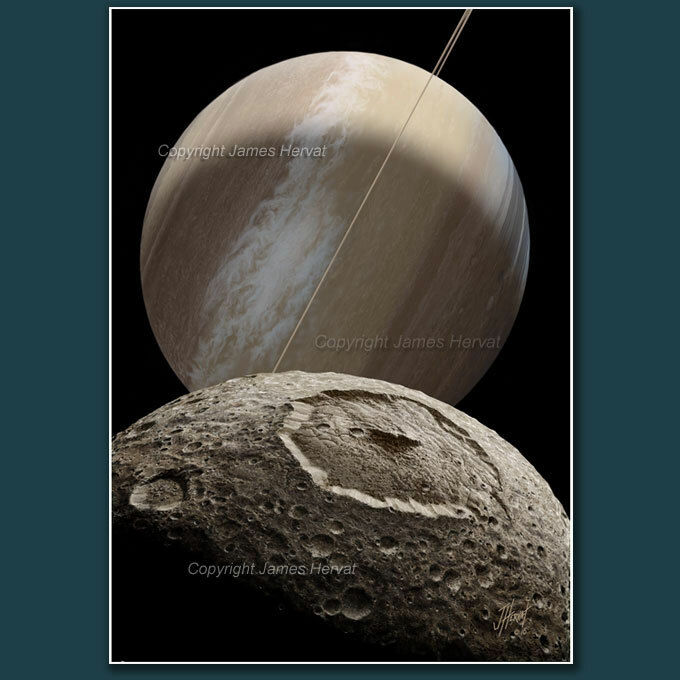 Storm over Mimas by James Hervat - One of Saturn' recurrent atmospheric disturbances is seen from just beyond its satellite, Mimas. Storm over Mimas (2010) - Compared to Jupiter's chaotic atmosphere, Saturn's windswept cloud-tops usually present a more serene visage when seen from afar. Approximately once every Saturnian year (29.5 of your Earth-years), however, a spectacular exception arises. First observed in 1876, it is a titanic atmospheric disturbance that has come to be known as "The Great White Spot". Depicted here is the 1990 apparition, which almost circled the planet's North Temperate Zone. The view is from just beyond Saturn's miniature satellite, Mimas. NOTE: the watermark seen on the image above does not appear on the prints.